Story: Living in a boarding house, the Tramp takes the fancy of the landlady, much to the annoyance of her family and the other boarders. Production: Gordon Griffith, who plays the camera-mad kid in this short, was one of the first successful child actors in American cinema. He not only made the switch from child star to adult actor, but also navigated the change from silent cinema to the talkies and, indeed, from appearing before the camera to working behind-the-scenes. As well as starring here with Chaplin (and in other later shorts, as well as an appearance in Tillie’s Punctured Romance), he’d go on to be the first actor to portray the character of Tarzan (as a child, in a 1918 film) and he played Tom Sawyer (in Huckleberry Finn, 1920). He worked as an assistant director in the 1930s and 1940s as the screen roles dried up, then became a producer through to the mid-1950s. His sparky and sly youngster is the catalyst for the drama in The Star Boarder as his ‘picture show’ at the short’s climax feeds the confusion of those watching—he’s the first of Chaplin’s child co-stars, a trend that would culminate in The Kid (1921) with Jackie Coogan. Edgar Kennedy (who also features in Tillie’s Punctured Romance) is the husband who fears that Chaplin’s lodger is usurping him in his wife’s affections. Like Ford Sterling before him, at this stage Kennedy is firmly wedded to the over-emoting Victorian school of acting that permeated much of early silent cinema. The eccentric moustache he sports only helps to exaggerate his features and grimaces, and he has great fun emoting away and over-signalling his feelings and intentions. Kennedy started as one of the original Keystone Kops and would later go on to star opposite the likes of Laurel and Hardy and the Marx Brothers, making his mark in a series of classic sound films and becoming well-known for his patented ‘slow burn’ reaction to the antics of the clowns he featured beside, as well as for directing a series of two-reel comedies for Hal Roach. 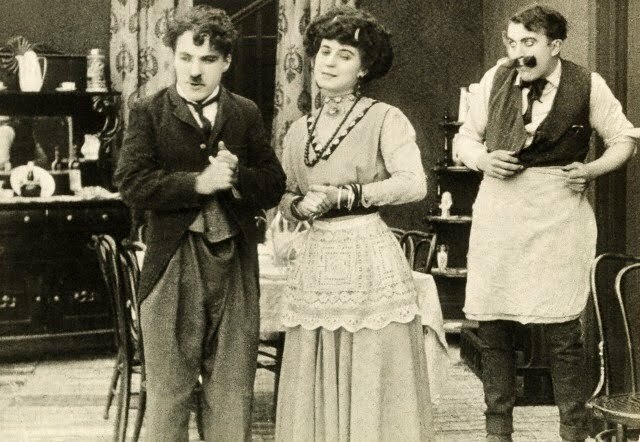 Chaplin has great fun here playing the boarder—who is dressed as the Tramp figure, but doesn’t act the same way—who can lord it over the rest due to the attentions of their landlady (Minta Durfee), often pulling faces at others when they fail to get their way or capture her attention. Chaplin once again displays the fleet-of-foot physicality that marked him out from so many of the other screen clowns of this period: the little dance he does when left alone in the pantry and goes looking for something to eat (or rather, drink) is a delightful moment. That’s followed by another outing for his ever-graceful drunk act. His face conveys everything we need to know about his discomfort when he has to sit upon the stolen pie in order to hide it (and the two bottles of beer) from a visiting friend of the landlady. For the first time perhaps we see Chaplin playing the most sympathetic role in the picture: gone is the violent tough that the early Tramp appeared to be. Out of everyone in this boarding house, he’s perhaps the least objectionable (even if he helps himself to all the beer and pie he can carry). It’s a trait that future films would build upon and develop, turning the Chaplin character into someone the film audience would root for (in his next short, Mabel at the Wheel, Chaplin would—in dramatic contrast—play the villain). Although directed by Nichols (seemingly with some input from Sennett), this is a slower paced, less frenetic Keystone short and more room is given over to character development by Chaplin, suggesting he was having an effect on his films even when he wasn’t in full control (a state of affairs that’s only a few films off). Slapstick: The tennis match affords much opportunity for falling over while swinging the racket and failing to hit any balls. A fall from a ladder sees the landlady and the boarder caught by the boy with the camera in yet another compromising situation, if viewed from the ‘right’ angle. Naturally everything ends in the usual Keystone rumble, but Chaplin manages to effectively separate himself and enjoys a personal struggle with the sheet that made up the screen. Finally, a one-on-one tussle with Edgar Kennedy brings the whole thing to an exhausting close. This entry was posted in Keystone by BJR. Bookmark the permalink.